Renta Group Oy is a Finnish construction machinery and equipment leasing company established in 2016.Renta operates nationwide in Finland with more than 200 employees in a network of 28 branches.The leasable offering covers a wide selection of construction site machinery and equipment and related services.In addition to a network of leasing branches, the company provides major scaffolding and weather protection as well as site services that both operate through dedicated companies. 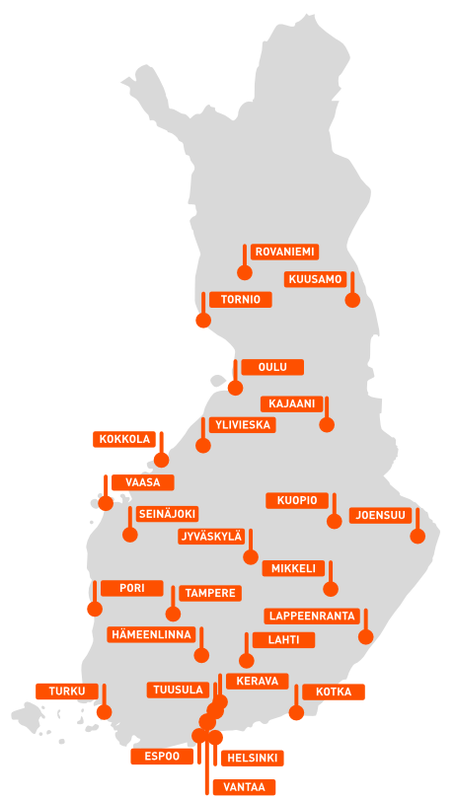 Renta was founded in early 2016.Its operations were kicked off by merging three Finnish companies.Telinekymppi Oy, Kehä-Kone Oy and Jasoca Oy create an excellent base for a new integrated, nationwide machinery and equipment leasing chain.In early 2018, the service expanded through the acquisition of Suomen Työmaapalvelut Oy.In the spring of 2018, Renta made its first international move by buying the Swedish Ståhl & Hyr chain of machinery leasing companies. Stål & Hyr operates normally as part of the Renta Group.At the moment, we operate in 25 cities through a netwrok of 28 branches.We lease the most common types of construction equipment, on-site units, scaffolding and weather protection.Our services also include site services from installations to planning.The company employs more than 200 persons. Professionals worth your trust and confidence, that’s who we are! Understanding the various needs of construction sites and industries requires insight, experience and professional expertise.Only by expertise and taking responsibility we can create the trust that enables integrated solutions for construction machinery and equipment, weather protection and on-site units leasing.As a customer of ours, you can be sure that the equipment that you need is in the right place at the right time. We offer modern machinery, devices, scaffolding, and weather protection for professional use, as well as logistics, installation and demolition work.Our objective is to be the most modern operator in the field, and we are constantly developing new electronic services to improve the service experience of our customers. Our entrepreneurial attitude and strong local knowledge are the key values of our business and visible in everything we do.Experience, speed and fluency guarantee good cooperation; we always keep our promises and operate responsibly.It is easy to do business with us. We find exactly the right solution in cooperation with the customer.Our objectives are successful service experiences and customer satisfaction. We operate nationwide, and in the nearest Renta branch, you can find modern, functional equipment, machinery, on-site units and scaffolding to meet your needs.You can be sure that your project will not break or fail because of missing or failing equipment.Our expert staff understands the needs of the most demanding projects and are able to help in any stage – from initial planning to project order and delivery.